We provide traditional upholstery skills to ensure that your car is brought back to its original condition. Our skills are used to carry out complete interior refits to make your car's interior look as good as new. By employing traditional methods and skills, and using comparable materials that were used by the manufacturer, we can make sure that the integrity of the vehicle is never compromised. We use polyurethane foam padding and PVC as well as more traditional materials like horsehair and cotton wadding to provide the best support and the very finest leather hides are also used for maximum durability and appearance. As well as leather upholstery we can replace and refit interiors including carpets, curtains, woodwork, veneers and all other interior fitments. 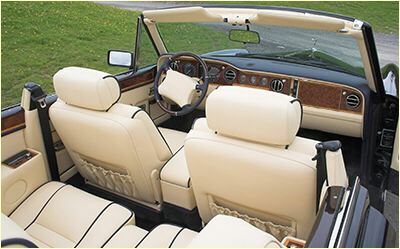 We can also replace leather and vinyl hoods and soft tops.